With 22 teachers producing individual “Learning Stories” for each child under their care, Unitec Early Learning Centre (UELC) knew they weren’t doing things as efficiently as they could. Multiple versions of multiple software applications were being used to create Learning Stories, of varying quality and consistency. So they called Kinetics in to help. Operating on the grounds of Unitec, but as a separate non-profit organisation, Unitec Early Learning Centre (UELC) have 22 teachers that provide early learning education. When Kinetics’ productivity coaches first visited (UELC) teachers were producing Learning Stories that ranged in quality. They were using a range of software tools in various versions, out-dated hardware with shared PCs & logins. They had an old hosted version of SharePoint with document libraries that were hardly being used. There were inconsistent styles and quality of completed learning stories and poor document storage practices. Most final versions of Learning Stories were being saved to the local PC instead of the relevant SharePoint document library folder. We built a customised coaching solution for teachers to attend in small groups, with the focus on how to build quality learning stories using Word and Publisher and teaching how to upload documents to SharePoint. The majority of teachers produced learning stories using Word and/or Publisher, but during coaching we discovered some staff use PowerPoint, Comic Life and Mac Pages instead. Our coaching focused on Word and Publisher enabling teachers to discuss the benefits (and any limitations) of each software tool and how to make best use of SharePoint as the storage solution. Each learning story must be fresh and unique to the child and their learning experience, so there was no set template for teachers to follow. However, we facilitated discussions around what makes a quality learning story, what would the family want to see/not see and how quality over quantity is the preference for any publication. Our aim was to combat some teacher’s tendencies to overuse pictures with very little text (often repeating the same learning or experience) and to inspire them to use modern styles and themes. During the sessions teachers provided feedback on barriers to their productivity. They were enthusiastic about the latest version of SharePoint, as they struggled to use their old, outdated version. They didn’t know about features like ‘Open in Explorer’ and Tags; and the Search and Explorer features weren’t working. They were excited to see how customising lists in SharePoint could be used to link learning objectives to documents and Learning Stories, helping teachers to see gaps and areas to focus on. Teachers attending coaching also requested hardware and software upgrades. With shared PCs a accessed from a Teacher’s Office a teacher was using a different version of MS Office and Windows, with differing speed and performance depending on the available PC. The ’lightbulb moment’ for many came when some teachers revealed they use online tools to insert Maori macrons in Learning Stories, whereas other teachers didn’t realise the tool existed. We added a link to the macron website on the Home page on SharePoint and it quickly became a valuable tool for all staff. Sharing this type of information ensures all teachers are productive, helps to make the learning story grammatically correct and inclusive, and gives teachers access to the tools they need. It also improves collaborative teamwork— regardless of what shift, location or classroom the teacher works in, they can access the tool when they need to. 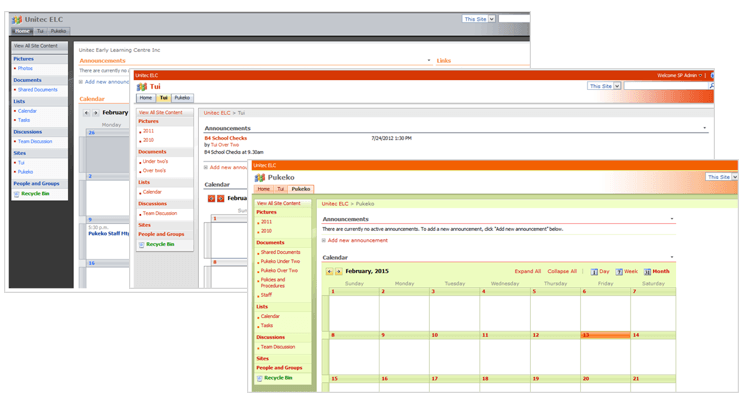 UELC’s old SharePoint had 3 sites, with a basic set up of document and image libraries , calendars and announcements. UELC staff were unable to use Open with Explorer and other features, so didn’t make use of its benefits. UELC’s new SharePoint site is built in Office365 and offers a modern interface for teachers to collaborate so they can share Learning Stories. It also provides flexibility and scalability for growth. The new SharePoint intranet has a Home site with four subsites – Tui, Pukeko, Management and Health & Safety. The Home site features “promoted links” that help users navigate to core lists/tasks, such as applying for leave, viewing the weekly “menu” or logging a health and safety issue. The Home site also displays a daily noticeboard, a list of upcoming events, a staff leave calendar (with automated request approval workflow), a wiki for policies and procedures as well as document and image libraries. Staff can now add to the Hazards and Maintenance issues list in the Health and Safety site. The H&S Committee use this site to store meeting minutes, relevant documents and share trading materials. The Management Site is a secure site that only the permission group ‘Management Team’ can access. This enables senior staff to collaborate on sensitive or confidential information in private. This site has a staff contact list, a document library, a notebook and a newsfeed, and displays site users, so those using it are confident it remains a secure area. This site will also be used to collaborate and store strategy and planning documents that the senior team work on/from. The Management Site is purposefully designed to look different to the other sites, to help the management team navigate and to assist with security access. During our coaching sessions, we covered features and functionality to improve productivity and help teachers to build quality learning stories. Following are examples of some of the learnings that made a meaningful difference to the UELC team.